But it looks like that there’s some way to go before ‘strategic partner’ becomes more than just a term of endearment. If we look at the 2009 Defence White Paper (for the time being still the government’s defence strategic policy), we find a curious ambivalence towards Indonesia. According to the White Paper, we have a ‘fundamental interest in controlling the air and sea approaches to our continent’ (paragraph 5.5). But in reference to a secure immediate neighbourhood, it says we should prevent or mitigate ‘nearby states [from] develop[ing] the capacity to undertake sustained military operations within our approaches’ (paragraph 5.8). There’s a contradiction there; as Hugh White notes in his Security Challenges essay (PDF), it may very well be those same capabilities Indonesia requires to ensure its own security in its northern approaches that could be instrumental in both Indonesia and Australia securing their strategic interests. In short, the language of the 2009 Defence White Paper simply doesn’t match our statements of Indonesia as a strategic partner. And although there are asymmetries in our capabilities, a strategic partnership means allowing and encouraging Indonesia to grow in a way that complements our strengths and compensates for our weaknesses so that we can work together; if Indonesia is to play an important role in our strategic future, then actively mitigating or preventing particular capacities isn’t the way to go. This position might have been justifiable in white papers released after Konfrontasi (during which Australia and Indonesia found themselves on opposing sides of the conflict) or shortly after the 1999 East Timor intervention, during which relations with Indonesia were more fractious and the military (TNI) was only just exiting Indonesian politics. But times have changed. On the domestic front, Indonesia is a much more stable, democratic state. In economic terms Indonesia is now starting to flex its muscle. Its GDP grew by an annualised 6.4% in the second quarter of 2012, its economy is now larger than Australia’s in purchasing power parity terms, and its middle class is larger than Australia’s population. TNI no longer exerts the same level of direct influence on politics and there’s a greater commitment to crack down on corruption. In regional terms, Indonesia enjoys greater clout and has attracted the attention of international partners such as the United States, the United Kingdom and China. 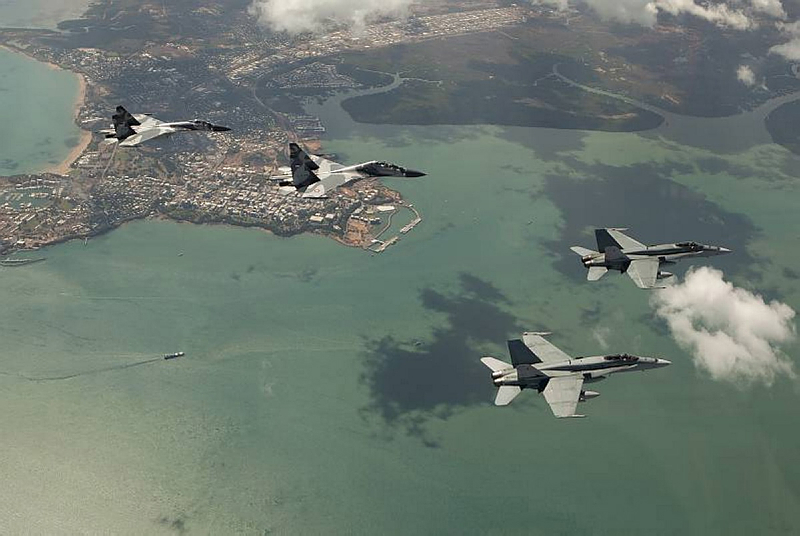 Recent participation in RAAF-hosted Exercise Pitch Black 2012 (see image) shows Indonesia’s willingness to engage with partners such as Australia by sending their newest aircraft to build person-to-person ties and to dispel doubt as to their military intentions. Barring a significant change in Indonesia’s trajectory of growth and domestic transformation, this is likely to become an enduring externality for Australian policy. Nonetheless, it’s worth thinking through the factors that could cause problems for Indonesia down the track: these include slowed growth, a change of leadership to one that is more internally focused, and deteriorating domestic stability. The question is whether these eventualities would adversely affect the Indonesia–Australia relationship in the long term or would merely slow the engagement temporarily. That said, the relationship between Indonesia and Australia seems to be on an unstoppable path of growth. A nationalist President of Indonesia would be a concern but wouldn’t necessarily require a radical rewrite of Indonesia’s place in our strategic interests. In any case, as one RSIS commentator notes (PDF), nationalism at present is not a call for concern. Likewise, Australia can cause ructions over livestock, people smuggling or the incarcerations of Australians, but the fundamental shared interests should ultimately prevail. In terms of shifting regional geopolitics, Australia and Indonesia might have more in common in the future Asia as we both navigate China’s rise and the US rebalance. A Defence Cooperation Agreement signed recently between Australia and Indonesia provides a framework for practical cooperation on common security matters, but it’s time to work together as well on bigger, long-term strategic questions about the region. Indonesia demands different handling in the next Defence White Paper, which is as much an opportunity as the Asian Century White Paper to correctly recognise Indonesia’s place. Language matters, because it sends a strong signal to both the Australian and Indonesian people about how we see each country’s place in the region. And while the majority of everyday people in each country may not delve into the pages of the White Paper, setting the tone for political interaction as well as doing away with ambiguous language remains important. Hopefully the 2013 White Paper will articulate Indonesia’s importance and elevate it to partner status rather than a subordinate. That sort of constructive language would remove the disparity between language of the 2009 White Paper and the increasing importance of close defence relations and alignment of strategic interests between the two nations. The White Paper might start by recognising the complementarity across our capabilities, strengths and weaknesses. Or it could, as Hugh White suggests, create a heading for Indonesia separate from the rest of ‘our neighbourhood’ to recognise the important role it plays in our strategic environment. While there’s no prospect of an alliance between our countries in the foreseeable future, it would provide a more robust basis in our national policy to give a broader context to initiatives such as the recently signed Defence Cooperation Agreement. Defence Minister Smith assures us that he is ‘committed to regular, open and transparent discussions with Indonesia on the development of Australia’s 2013 Defence White Paper’. Let’s hope the final cut pays them the same due respect.